I had a ruby project named "bootstrap_helper", which has 43 watchers on Github. I thought having 43 watchers is sort of popular. But there is a weired thing: when I search keyword : "bootstrap helper", my gem is not in first page result. Then I found I made a hugh mistake: Ruby naming convention told Ruby developer to name everything with underscore. So every developer names their projects with underscore. 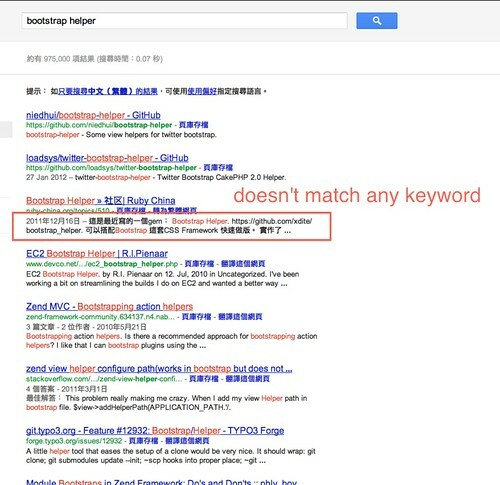 But it's a giant SEO mistake: Search Engine treats snake_keywords as CamelKeywords. If your project's name contains meaningful keywords, it won't be matched. Because "snake_keywords" means "SnakeKeyword" not "snake keywords". It's really bad for SEO.